Adam Alstadt was a farmer and landlord. He bought his father's 150 acres of land in 1762, and expanded it upwards of 1,100 acres by 1780. He served in the Pennsylvania Line during the Revolutionary War as a Captain. 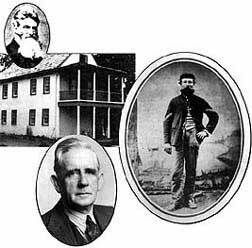 His sons, Jacob Allstadt, John N. Allstadt and Daniel Allstadt moved to Berkeley County, Virginia (later Jefferson County, West Virginia), around 1794 and settled just south of Harpers Ferry. The "Allstadt" spelling was adopted by these families after the turn of the 19th century. along with the Allstadt slaves were among the hostages taken by John Brown's raiders to the Harpers Ferry Armory on October 17, 1859. John Thomas served in the Confederate Army in the 1st Virginia Infantry. John N. Allstadt's grandsons, George K. Alstadt, Harrison Alstadt and John H. Alstadt, though born in Shenandoah County, Virginia, served in the Union Army in the Ohio Infantry. ............................................................................ + Earnest R. Goodheart, Jr.